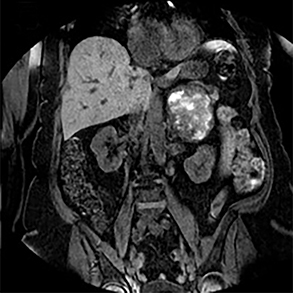 A 72-year-old female with a prior history of breast cancer presented with mild acute kidney injury. She underwent renal ultrasonography which identified a mass and prompted further imaging. An MRI demonstrated a nonspecific large left suprarenal mass which was subsequently resected. Pathology demonstrated the mass to be angiosarcoma. A six-month postoperative FDG PET-CT was preformed which showed new hypermetabolic focus in the left prevascular mediastinum. Subsequent CT-guided biopsy revealed metastatic disease. Initial abnormalities on the renal ultrasound prompted further investigations and due to the patient’s AKI a MRI was performed. 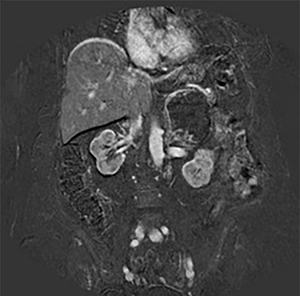 Renal protocol MRI examination showed a large, complex mass appearing to arise from the left adrenal gland (Figure 1), which correlated to the suprarenal lesion on the sonogram. This mass was markedly heterogeneous on the T1 and T2-weighted image, with areas of T1 hyperintensity suspected to represent hemorrhagic material, as well as central T2 hyperintensity likely related to necrosis, and exhibited irregular internal and nodular peripheral enhancement. The patient underwent resection of the suprarenal mass which was consistent with epithelioid angiosarcoma with extensive infarction. Subsequent to the pathologic diagnosis, the patient underwent an 18-F fluorodeoxyglucose positron emission tomography-computed tomography (FDG PET-CT) scan to assess for metastatic disease, which showed expected post-surgical and reactive changes with no definitive metabolic evidence of surgical bed residual tumor or regional or distant metastasis. Differential diagnoses: hemorrhagic and or necrotic metastases, adrenal cortical carcinoma or pheochromocytoma. The described MRI appearance of adrenal angiosarcoma is that of punctate calcifications, intense peripheral enhancement and a necrotic center.7 It can also have loss of signal on out-of phase imaging secondary to foci of intracytoplasmic lipid.8 In our case, the MRI appearance was heterogeneous in signal intensity on all sequences, containing foci of T1-weighted hyperintensity, T2-weighted hypointensity related to hemorrhagic byproducts, T2-hyperintensity in regions of necrosis seen at pathology, and non-uniform, peripheral contrast enhancement. This nonspecific appearance leads to difficulty making a definitive diagnosis based on MRI. Angiosarcomas commonly occur in the skin, soft tissue, breast, bone, liver, and spleen. The MRI appearance is variable owing to the various stages of hemorrhage, necrosis, cystic degeneration, and viable tissue present within the lesion. Although rare, angiosarcoma can also arise in the adrenal glands. Our case report shows that adrenal gland angiosarcoma can have a similar appearance to adrenal cortical carcinoma. Adrenocortical carcinomas are usually large at diagnosis and appear heterogeneous on both T1- and T2-weighted images owing to the presence of internal hemorrhage and necrosis. The behavior of adrenal angiosarcoma on FDG PET is not well studied. In our case, as well as in two additional reports, the surgical bed recurrence and metastasis were hypermetabolic. Glazer HS, Weyman PJ, Sagel SS, Levitt RG, McClennan BL. Nonfunctioning adrenal masses: incidental discovery on computed tomography. AJR Am J Roentgenol. 1982;139:81-85. Hedican SP, Marshall FF. Adrenocortical carcinoma with intracaval extension. J Urol. 1997;158:2056-2061. Travis WD, Oertel JE, Lack EE. Miscellaneous tumors and tumefactive lesions of the adrenal gland. In: Lack EE, ed. Pathology of the adrenal glands. New York, NY: Churchill Livingstone, 1990:351-378. Weiss SW, Goldblum JR. Enzinger and Weiss’s soft tissue tumors. 5th edn. Philadelphia, PA: Mosby, 2008. Sung JY, Ahn S, Kim SJ, Park YS, Choi YL. 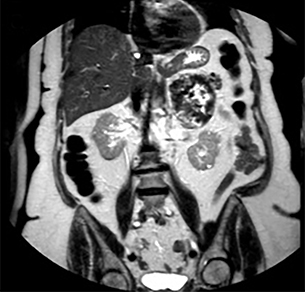 Angiosarcoma arising within a long-standing cystic lesion of the adrenal gland: a case report. J Clin Oncol. 2013;31:e132-136. Hayashi T, Gucer H, Mete O. A mimic of sarcomatoid adrenal cortical carcinoma: epithelioid angiosarcoma occurring in adrenal cortical adenoma. Endocr Pathol. 2014;25:404-409. Otal P, Escourrou G, Mazerolles C, Janne d’Othee B, Mezghani S, Musso S, et al. Imaging features of uncommon adrenal masses with histopathologic correlation. Radiographics. 1999;19:569-581. Schlund JF, Kenney PJ, Brown ED, Ascher SM, Brown JJ, Semelka RC. Adrenocortical carcinoma: MR imaging appearance with current techniques. J Magn Reson Imaging. 1995;5:171-174. Fury MG, Antonescu CR, Van Zee KJ, Brennan MF, Maki RG. A 14-year retrospective review of angiosarcoma: clinical characteristics, prognostic factors, and treatment outcomes with surgery and chemotherapy. Cancer J. 2005;11:241-247. Derlin T, Clauditz TS, Habermann CR. Adrenal epithelioid angiosarcoma metastatic to the epicardium: diagnosis by 18F-FDG PET/CT. Clin Nucl Med. 2012;37:914-915. Lepoutre-Lussey C, Rousseau A, Al Ghuzlan A, Amar L, Hignette C, Cioffi A, et al. Primary adrenal angiosarcoma and functioning adrenocortical adenoma: an exceptional combined tumor. Eur J Endocrinol. 2012;166:131-135. Nieweg OE, Pruim J, van Ginkel RJ, Hoekstra HJ, Paans AM, Molenaar WM, et al. Fluorine-18-fluorodeoxyglucose PET imaging of soft-tissue sarcoma. J Nucl Med. 1996;37:257-261. Varkey J, Astani SA, Pantelic M, Dalal I. 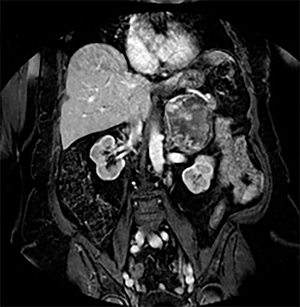 Rare case of angiosarcoma of the adrenal gland seen with multiple modalities. Appl Radiol. 2017;46(10):30-32. Prepared by Dr. Varkey while a Radiology Resident at Henry Ford Hospital, Detroit, MI. ; Dr. Astani while a Radiology Fellow at Beaumont Hospital, Royal Oak, MI. ; Dr. Pantelic while a Radiologist at Henry Ford Hospital and Clinical Assistant Professor of Radiology at Wayne State University School of Medicine, Detroit, MI. ; and Dr. Dalal while a Radiologist at Henry Ford Hospital.